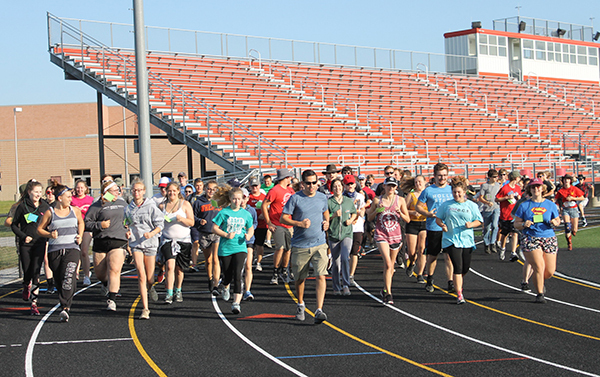 Tag Archive | "Marching Band"
The Cedar Springs High School Marching band recently attended band camp where they worked on their 2018 show entitled “We the people.” At the end of the week, they did performed for the community to showcase what they had learned. 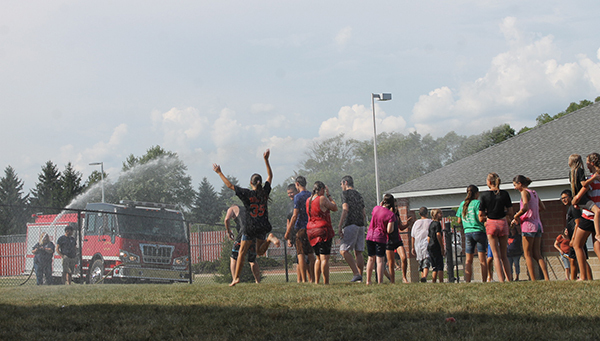 The band is grateful to the Cedar Springs Fire Department for hosing them off after a hot day, and appreciates the community for their support! Saturday, October 21, was a gorgeous day to be in marching band. At 6:15 pm the Cedar Springs Marching Band took the field in Jenison, along with 42 other bands from around the state. All the shows were wonderful and well worth the price of admission. Cedar Springs placed fourth in flight III competition with a score of 86.95. Great job Marching Red Hawks! We are all proud of your hard work! Next week the Marching Red Hawks will compete at Rockford in the Reeths Puffer Invitational. Red Flannel Queen Jenna Alcumbrack is also a drum major in the Cedar Springs Marching band. Photo by LeeAnne Whilden. 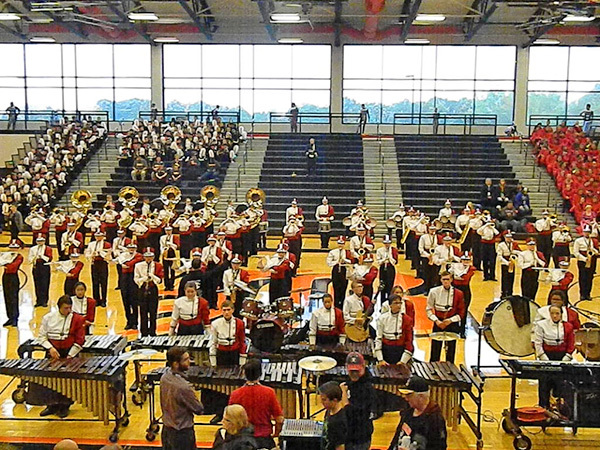 The Marching Red Hawks took their show inside at Belding and brought home a first place finish. Photo by Kelli Hamilton. 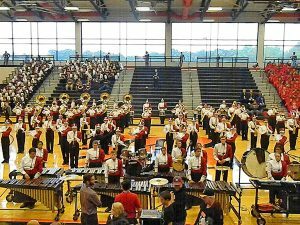 After taking 3rd place at the Rockford Invitational Sept. 23, Cedar Springs High School hosted 20 bands for the 57 Annual Red Flannel Invitational October 7. The leadership team started the day with the Star Spangled Banner during the flag raising ceremony, along with the Red Flannel Queen and Court. On October 14, Cedar Springs Marching Red Hawks marched into Belding, on a crazy rainy day, and took first place. The competition was moved indoors due to rain. The Marching Hawks have been working hard on their show, Picasso, and would love you for everyone to come and see them perform. 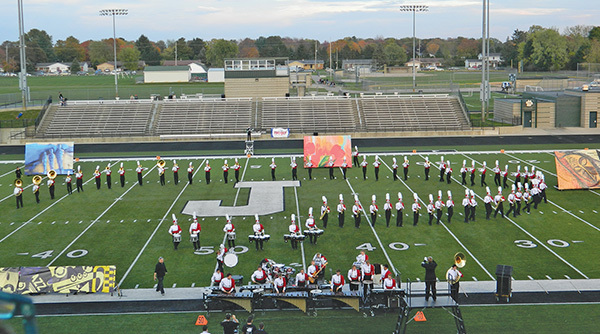 Their last three shows are Jenison Oct. 21, Rockford West Shore Invitational Oct. 28, and MCBA State Competition, November 4, Detroit Ford Field. Times TBD. 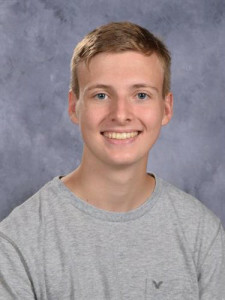 Gavin is a senior percussionist at Cedar Springs High School who has been a marcher in the drumline and also been a leader in the keyboard section during marching band season. He has been the drum set player for the CSHS Jazz band for the last 3 years. Gavin is a hard worker in the classroom with a current GPA of 4.1, which ranks him in the top 4 in his class! Congratulations Gavin Moore on being named our April 2017 Cedar Springs High School Scholar Instrumentalist! Brooke Ross is an outstanding senior in the Cedar Springs High School Band. She is the section leader for the front ensemble keyboards during marching band, plays oboe during concert band and has been the jazz pianist in the high school jazz band for all four years. 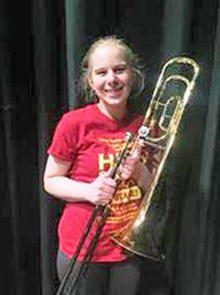 Brooke was one of only four students awarded a college scholarship at MCBA State Finals this past November and plans to continue her music studies next year at Western Michigan University. Congratulations Brooke Ross on being named our March 2017 Cedar Springs High School Scholar Instrumentalist! Nicole was the senior section leader of the trombones for marching band, member of our top concert band, Wind Ensemble, and is a member of the Cedar Springs Jazz Band. She is an outstanding student leader, is very dedicated and hard-working. The 2016-2017 school year is off to a great start in the 6th grade band. 130 band students are learning to play instruments for the first time, and they are have already progressed quite a bit. Band Directors Adam Borst, Ryan Miller, and student teacher Adam Ronning are very impressed with the students’ abilities so far, and are looking forward to another great year of band at Red Hawk Elementary. The budding instrumentalists are playing flute, clarinet, trumpet, trombone, baritone, and percussion, and will later have the chance to try tuba, French horn, and alto saxophone. The students will perform 3 full band concerts this year: November 17th, February 9th, and May 18. There is also a solo event on January 26th. All concerts start at 7:00 pm, and are performed in the High School Auditorium. CONGRATULATIONS to our Cedar Springs High School Marching Band who placed 3rd in their class at the Jenison Invitational October 22, 2016! They had the best show of the season and scored an 87.725, the highest score of the past few seasons! 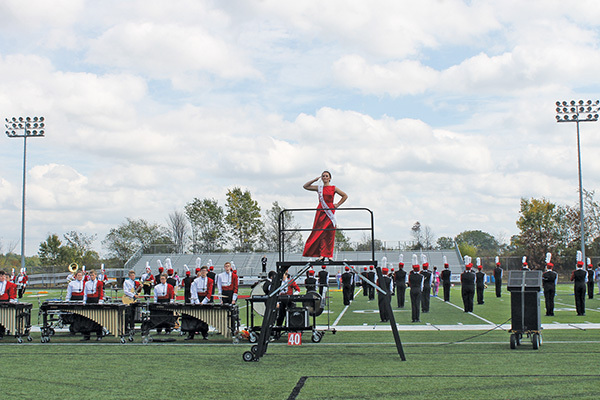 The band performed Saturday, October 29 at the Westshore Invitational held at Rockford High School at 7:30pm where Cedar Springs placed 3rd. 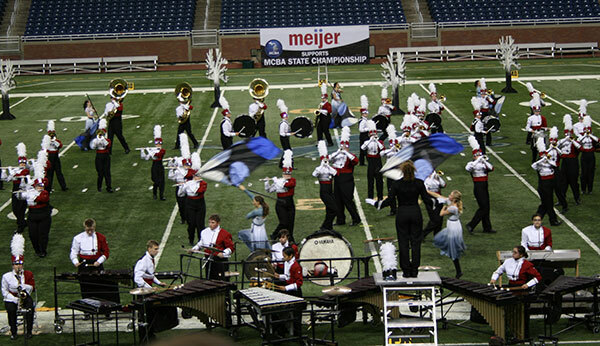 The band will perform on November 5 at MCBA State Finals at Ford Field mid-afternoon. Go Red Hawks! 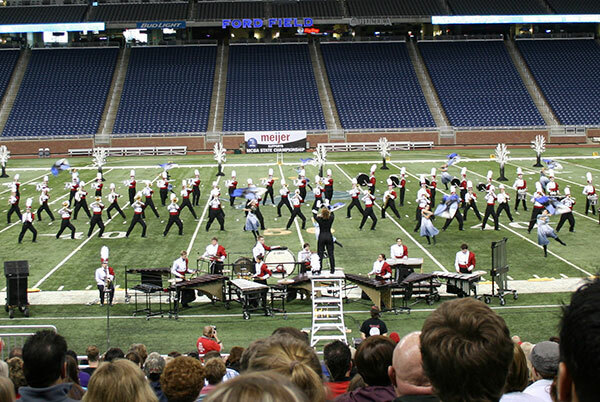 The Cedar Springs High School Marching Band traveled to Ford Field on Saturday, November 7, for the Michigan Competing Band Association (MCBA) State Marching Finals. 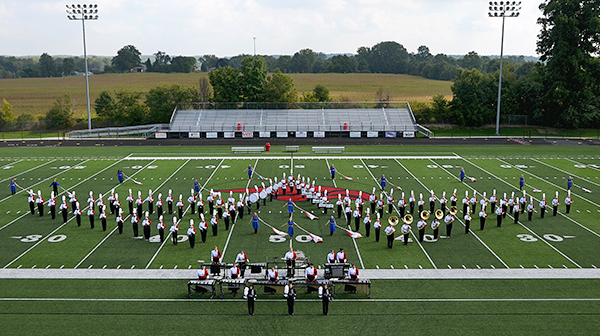 They finished ninth in the state in Flight III competition, which consisted of 12 bands. The season ends with their annual Marching Banquet, held on November 16, and the band moves into Concert season this week. Their next performance will be a Christmas Concert on December 10 at 7:30 p.m. The concert is held at the high school, and admission is free.